For some reason I’m finding it quite hard to focus at the minute. I don’t know if everyone has days, weeks or even months like this, but right now I feel like every time I start one task I need to start something new. It’s not only been happening at home and work, but also here on the blog, and I have had 3 maybe 4 posts up and running for the last few weeks. It’s not for lack of passion or excitement either. Each of the recipes tasted fantastic, were fun to photograph and put a smile on the faces of friends and family who tried them so they should have been easy to post. After asking those readers who follow me on Twitter and Facebook which recipe they’d rather see, this Samosa Pie was the most popular so I decided I had better get a move on and share it with you. I’m not often a fan of dishes that have been de-constructed and then put back together again without any rhyme or reason, but the Samosa Pie is a little bit different. The idea was that I’d take the flavours of a traditional Indian snack and make it a teeny bit healthier (by skipping out the frying) and turning it into a hearty dinner that the whole family could enjoy. Filo pastry has lots of uses, not just for wrapping up tasty samosas but also as a healthier alternative to puff or shortcrust pastry on the top of pies. What I’ve done is to take the spiced mince filling of a samosa, and bake it in a deep pie dish with a crispy filo pastry top. Just like samosas, I recommend serving this Samosa Pie with a wedge or two of lemon. It will remind you of your favourite takeaway side dish. In a large pan, heat the oil and add the cumin seeds. Toast for a few minutes before they begin to release their aroma. Add the onions and the other spices, including the garlic and cook for 5-10 minutes on a medium heat until the onions are translucent and have softened. Next add the diced carrot, onion and the frozen peas along with the lemon juice and half of the water. Cook for another 10 minutes or until the potatoes have begun to soften. (If using the quorn mince add this now and cook for another 10 minutes). Finally add the remaining water. Heat the pie filling on a high heat until the mixture is bubbling and the vegetables have all begun to soften. Transfer to a deed pie dish. Top with each of the filo pastry sheets, scrunching to create a crinkled effect before adding to the pie dish. Spritz with a little extra oil and place into an oven at 180 C for roughly 20 minutes or until the pastry is golden and crisp. 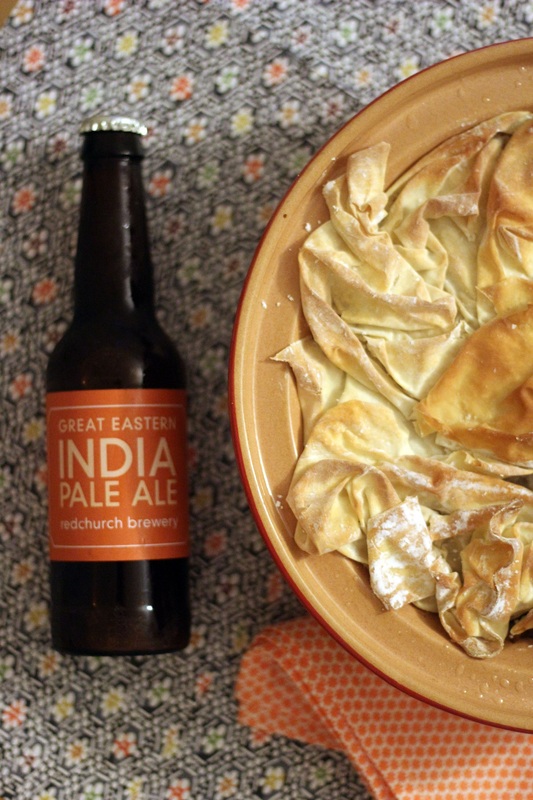 We also served the Samosa Pie with Great Eastern India Pale Ale from Redchurch Brewery. My other half Jon will be reviewing this beer over at Drink Drank Drunk soon. Without spoiling what he’s got to say against the beer, the IPA was light and refreshing with worked really well against the rich and spicy Samosa Pie filling and crisp filo top. Personally I’m partial to a Gin & Tonic, particularly paired with Indian food. What would you drink alongside this Samosa Pie? Let me know in the comments below! Jon often tries paring a cheeky beer or two with my recipes but I haven’t yet convinced him to blog about his recommendations. Watch this space to find out more about what we’ve been drinking with dinner. But until then it’s just me and my recipes. I hope you’ve enjoyed this Samosa Pie! Thanks Kerry. 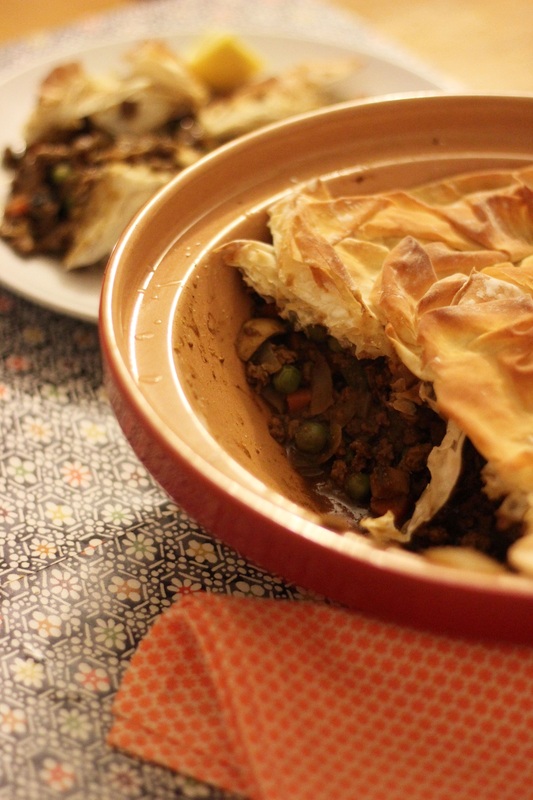 I love how easy it is to make this vegetarian too – good old quorn mince! OK, this seriously is making me hungry! Wow, you’ve got a great recipe here! I adore samosas and being a pie would make it all the better! Looks absolutely delicious! Thanks Lia! My motto is if it tastes good snack size it will taste AMAZING family size 😀 after all bigger is better!!! Lol! I couldn’t agree more: )! What a great idea! This looks like a really delicious family dinner. That pastry looks so nice! And it’s good to know it’s a little healthier than puff/shortcrust pastry. This sounds lovely. Very original! This looks so hearty and delicious! 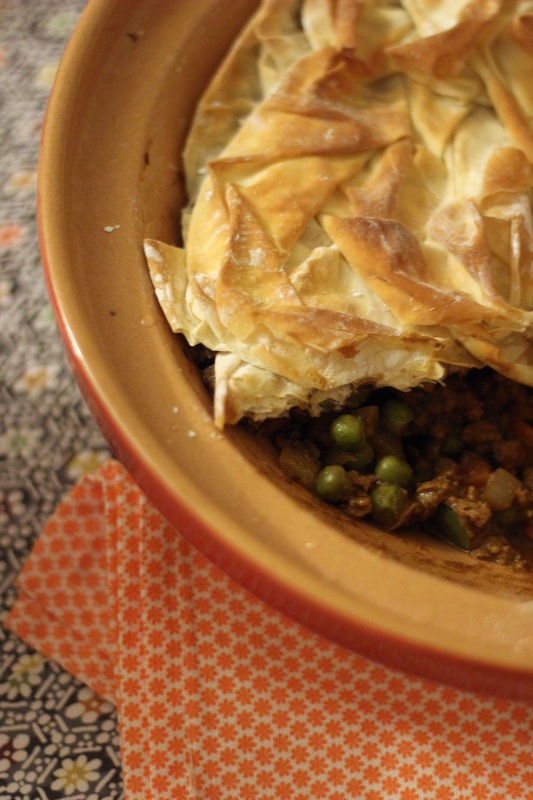 I love the idea of a spiced pie on a cold evening – yum! Thanks Isabella! With the rubbish weather we are having here at the minute a hearty pie is definitely welcome!!! Pure genius – that is all! Oh this is fabulous. I <3 it Adding more pastry to the shopping list as I type. What a brilliant idea, but so much healthier than eating the pastry on a regular samosa. Love the filo topping, so pretty too! Thanks Laura! I love the crinkly effect the filo gives too 🙂 every pie is different! I’m going to make this this evening. I’ll let you know how it goes!